Did You Know About the Other Tea Party? 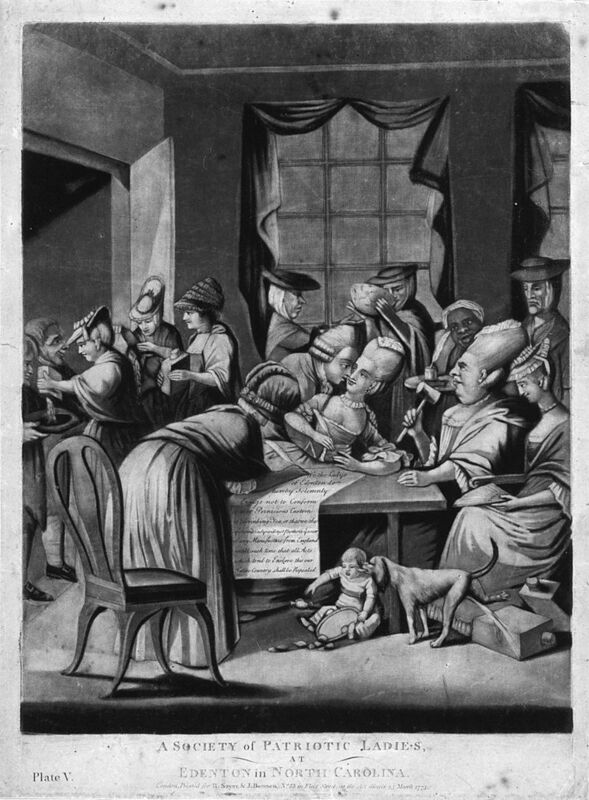 A British cartoon satirizing the Edenton Tea Party women. Not long ago I learned about another famous American Tea Party. However, it seems it is famous only to a relatively small group of people. On the way to Elizabeth City, NC in northeastern North Carolina, I passed through a small town called Edenton. I learned Edenton is famous for its own Revolutionary War era Tea Party. I had never heard of this. Therefore, I decided to do a little digging. The Edenton Tea Party … a political protest organized in Edenton, North Carolina in 1774. Like the Boston Tea Party, it was in response to the Tea Act passed by the British Parliament in 1773. The Edenton Tea Party is a historic landmark event. Not because of the boycott on tea … such protests were happening all across the Thirteen Colonies. This tea party is most noteworthy because women organized it. Penelope Barker led a group of 51 women who met on October 25, 1774. These women wrote and signed a statement of protest, vowing to give up tea and boycott other British products. Maybe it has only been men who have protested the king up to now. That only means we women have taken too long to let our voices be heard. We are signing our names to a document, not hiding ourselves behind costumes like the men in Boston did at their tea party. The British will know who we are. The Signers of the Declaration include: Abagail Charlton, Mary Blount, F. Johnstone, Elizabeth Creacy, Margaret Cathcart, Elizabeth Patterson, Anne Johnstone, Jane Wellwood, Margaret Pearson, Mary Woolard, Penelope Dawson, Sarah Beasley, Jean Blair, Susannah Vail, Grace Clayton, Elizabeth Vail, Frances Hall, Mary Jones, Mary Creacy, Anne Hall, Rebecca Bondfield, Ruth Benbury, Sarah Littlejohn, Sarah Howcott, Penelope Barker, Sarah Hoskins, Elizabeth P. Ormond, Mary Littledle, M. Payne, Sarah Valentine, Elizabeth Johnston, Elizabeth Crickett, Mary Bonner, Elizabeth Green, Lydia Bonner, Mary Ramsay, Sarah Howe, Anne Horniblow, Lydia Bennet, Mary Hunter, Marion Wells, Tresia Cunningham, Anne Anderson, Elizabeth Roberts, Sarah Mathews, Anne Haughton, and Elizabeth Beasly. Finally, while many famous documents from the American Revolution exist in the united States, this petition survives only through British accounts. The text of the petition, and the list of signers, was printed in the Morning Chronicle and London Advertiser on January 16, 1775. As a result, many Americans do not even know this Tea Party occurred. As we cannot be indifferent on any occasion that appears nearly to affect the peace and happiness of our country, and as it has been thought necessary, for the public good, to enter into several particular resolves by a meeting of Members deputed from the whole Province, it is a duty which we owe, not only to our near and dear connections who have concurred in them, but to ourselves who are essentially interested in their welfare, to do every thing as far as lies in our power to testify our sincere adherence to the same; and we do therefore accordingly subscribe this paper, as a witness of our fixed intention and solemn determination to do so.